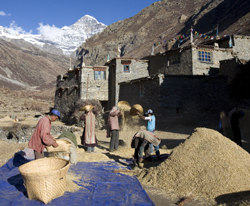 The Nepal Trust supports local communities to optimize their food processing capacities & implements agricultural/ environmental awareness programs to educate people about agricultural development, food security and food storage to increase the quality and quantity of food in remote mountain areas. Expansion agriculture and food security projects, e.g. vegetable/ production, fruit cultivation, cattle and livestock projects, etc.